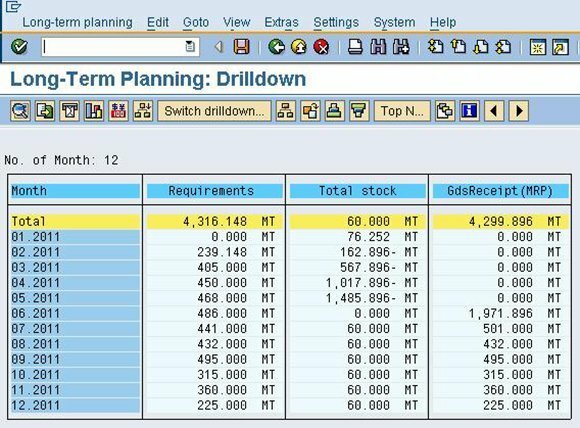 Use SAP Long Term Planning simulation scenarios to make better decisions about procurement, production, resource planning and warehouse storage. products that have direct implications for production and procurement planning. It's fairly easy for a company to evaluate the impact of increased sales on profitability and market share, but some production and procurement planners might be unaware that SAP Long Term Planning (LTP) is a valuable tool that can support and facilitate their own what-if calculations. Without information about these variables, optimized procurement and production planning are difficult to achieve. Here's where SAP Long Term Planning comes in. It's a simulation tool for testing hypothetical assumptions that affect business decisions. The advantage of using LTP instead of materials requirement planning -- also known as "operative planning" -- is that LTP doesn't affect the database of results that is created when MRP is run. LTP is a dedicated and separate area in SAP ERP for all simulation-related planning. However, you can also transfer LTP simulation results into operative planning if necessary. SAP Long Term Planning provides support for long-term procurement and production planning and for carrying out simulations in short- and mid-term planning. For an annual or rolling quarterly planning run, for example, SAP LTP can estimate future stock and material requirements. It also can show how sales and operations planning, or S&OP, influences resources, capacities, warehouse stock, capital and manpower. Long Term Planning derives its planning details from information that is already in the SAP ERP system. This includes the planning data for finished goods, and details on their components that are managed in the bill of materials, or BOM. The planning data could include, for example, monthly quantities of finished goods already entered in the system as planned independent requirements, or PIRs. When you run the simulated MRP, the SAP LTP system creates simulated planned orders (order proposals) for the specified scenario. LTP can also calculate average plant stock for all the materials that went through the simulation. It derives that figure by adding up the total stock for the evaluation period and dividing it by the number of months in the evaluation period. Armed with average plant stock figures, the purchasing and inventory management departments can better coordinate with vendors for timely deliveries, and warehouse managers will get advanced notice of the space that will be needed for the incoming stock. The purchasing department can benefit from the results of SAP Long Term Planning in other ways. For example, the department can use information about future requirements to estimate and plan orders. This information also serves as a basis for negotiating delivery schedules and long-term contracts with vendors. Vendors also benefit because they receive a preview of the company's future procurement needs, which could help them take action to ensure they can meet the impending demand. In addition, the company's capacity planner gains a comprehensive view of machine capacities, including overloads, and can accordingly plan additional resources or manpower or procure additional machines. If the results of an SAP LTP simulation are satisfactory, they can be transferred easily to Operative Planning, on which the actual MRP then is run. The option to copy simulated planning results to Operative Planning saves an enormous amount of work already done during the LTP process and eliminates redundant data entry. Further, it provides flexibility to change MRP. You only need one to two hours of user training in SAP LTP to understand the basics of long-term planning and the factors that affect the results. 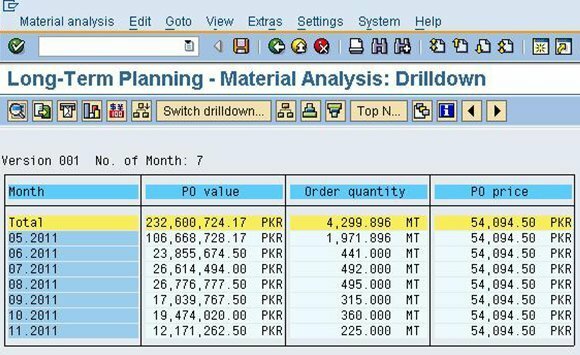 Figure 1 shows the results of a material planning process in SAP LTP, including a month-by-month breakdown of the value, quantity and price of a component of a purchase order. You can use a standard price, moving average or planned future price to calculate purchase order values. In Figure 2, the second column from the left shows the total monthly requirements for a component, followed by the stock situation and finally, how much revenue must be received per month against the procurement proposals generated by MRP or LTP (shown in the right-hand column, titled GdsReceiptMRP). Jawad Akhtar is an assistant vice president and SAP project manager for AbacusConsulting, where he focuses on supply chain management issues. AbacusConsulting is based in Pakistan. Can SAP special procurement improve my supply chain?